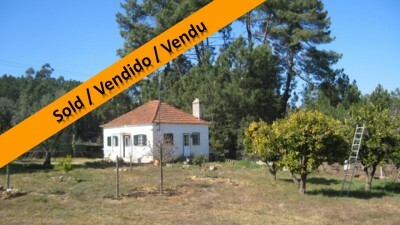 A two bedroom restored country cottage with 2,050 square metres of land for sale near Cernache do Bonjardim. The cottage, which is set over one floor, is situated in a quiet and tranquil area and comes with a single storey barn. The cottage is connected to both mains electricity and water and has been completely restored with new flooring, windows, electrics and plumbing. the cottage measures 53 square metres of construction and is accessed via a dead end road. The cottage has aluminium framed double glazed windows and exterior door and the flooring throughout is tiled. The cottage’s roof is wooden and in very good condition. Although the cottage is set over one floor there is a spacious attic, which has been designated for habitation, though would need the roof insulating. The main entrance to the cottage leads into a hallway, which opens out into an open plan living room and kitchen. The kitchen has a selection of built in base and eye level wooden units with granite work surfaces. Off the kitchen there is a stone staircase which provides access to the attic. The cottage has two bedrooms, both of which are accessed off the entrance hallway. The bathroom, which is fully tiled, is also accessed off the hallway. The bathroom has a bath with shower above, toilet and vanity basin with storage cabinet beneath. The cottage is set on a plot measuring 2,050 square metres, the majority of which is flat. There is a very good variety of mature fruit trees including tangerine, lemons, orange, Nespera, cherry, Olive, apple and plum. The property has a well for irrigation purposes, which is well stocked with water. There is a single storey barn on the land, which has been divided into four individual storage rooms/ or animal shelters. The barn has electricity connected with sockets and lights. The cottage is situated on the edge of a woodland, where there are many trails for cycling and walking. There is a stream only 800 metres from the cottage. The closest town to the property is located at Cernache do Bonjardim, which has cafes, bars, shops, mini-market, pharmacy and schools. The larger town of Serta is approximately eight kilometres from the property. Serta has several supermarkets, shops, restaurants, banks, schools, health centres, cafe bars, parks and municipal buildings and is easy to access off the IC8 dual carriageway. The closest airport to the property is located at Lisbon, which is approximately two hours drive way. Porto airport is slightly further taking approximately two and a half hours. Both Lisbon and Porto airports are serviced by several low cost airlines which operated regular flights into and out of the United Kingdom and other European countries.